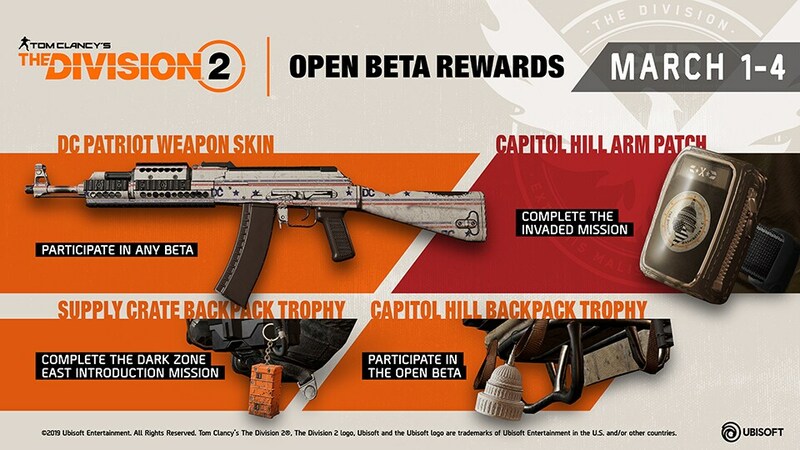 "Explore a transformed Washington DC and get a glimpse of Tom Clancy's The Division 2 in the Open Beta. Play through 3 main missions, 5 side missions, and discover the eastern part of the open world full of additional activities. Immerse yourself in The Division 2 endgame with three all new specializations, and a challenging endgame mission! Fight in Skirmish 4v4 PvP Mode and experience the all new, revamped Dark Zone East to receive an exclusive backpack trophy." is anyone in it now? Is it good? I've never played the first one....Pantheon/Crowfall/Camelot not out for another 3 months so I'm hella interested. I enjoyed the story/PVE experience in the first division and that is still a strength in the Division 2. So far, I have only played a couple of the story missions; I have yet to make it into the dark zone. the dark zone being the Free for all PVP area. this game has 3 dark zones; but it looks as if only one is in the beta. im by no means great at division 1... but the endgame difficulty is there so far in division 2, if the Invaded mission is to be a benchmark. decent mission design, really looking fwd to seeing raids.